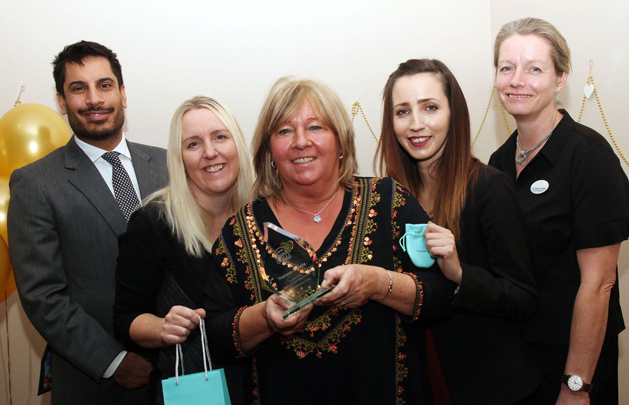 Theresa Cavalla, a Lifestyle Co-ordinator and carer from Chingford, has won a Heart of Gold Award at a ceremony at 1 Sewardstone Close care home in Waltham Abbey yesterday, Monday November 21st. Theresa has worked at the care home since 2011. Theresa was presented with a Tiffany necklace to commemorate her success by Rahim Dhanani, Executive Director of Enable Care, the company that owns 1 Sewardstone Close. Nominations for the award came from residents and their relatives, co-workers, social workers and local health professionals. Theresa was chosen from the list of nominations by a panel of previous Heart of Gold award winners from all the other homes in the group. Altogether there were 30 nominees for the award at 1 Sewardstone Close and all nominees received a Heart of Gold lapel pin.